SUMMARY: A 66-year-old man with multiple myeloma treated with zoledronic acid, melphalan, and prednisone after a tooth extraction developed severe osteonecrosis of the mandible that was nonresponsive to antibiotic therapy. A CT scan showed innumerable fragmented sequestra in the mandible and some adjacent soft tissue fullness around the mandible. The association between the use of bisphosphonates and osteonecrosis of the jaw has been described only recently. A 66-year-old man was diagnosed with MM in 2002. Shortly after his diagnosis, treatment with zoledronic acid, melphalan, and prednisone was initiated. After approximately 2–3 months, he developed a loose mandibular molar, which was removed. The extraction socket never healed, and the patient underwent biopsy of the exposed bone, which was consistent with osteomyelitis. He was placed on multiple courses of antibiotics without resolution of the exposed bone. During that interval, the teeth adjacent to the nonhealing socket also became loose and were subsequently removed sequentially. In October 2003, the patient complained of jaw pain and numbness of his lower lip and chin. On physical examination, the patient had large areas of exposed and seemingly nonvital bone in the mandible bilaterally. This was especially prominent along the mylohyoid ridge areas. There was purulent exudate within the open wounds and a fetid odor. There were multiple mobile teeth within the mandible. The patient had anesthesia along the dermatome distribution of the right inferior alveolar nerve. There were no lesions present within the maxilla, and all of the maxillary teeth were stable. Panoramic radiographs showed areas of patchy radiolucency within the mandible, widened periodontal ligament spaces around the mandibular dentition, and periosteal bone deposition along the inferior border of the mandible. Aggressive local wound care was initiated, and the patient had a satisfactory response with near resolution of the infection and decrease in pain. Reparative granulation tissue in intervening sites along the open wounds was noted during a 2-month period. The patient was then lost to follow-up until February 2005, when he returned to the office complaining of severe pain. He had stopped treatment. On intraoral examination, the patient had copious purulence from large areas of exposed, necrotic bone along most of the mandibular alveolar ridge. Thin intervening bands of normal-appearing mucosa were present within the anterior mandible. He was noted to have 2 draining fistulas in the submental area with active purulent exudate. Palpation of the exposed bone in the right posterior mandible resulted in mobility of the exposed bone in the anterior and left mandible. A panoramic radiograph showed large areas of bone destruction throughout the mandible with proliferative bone deposition along the inferior border. A CT scan showed (Fig. 1) innumerable fragmented sequestra in the mandible, starting at the level of the coronoid process on the right and the midramus on the left, extending through the angle and body bilaterally and including the symphysis. There was some soft tissue fullness adjacent to the posterior body of the mandible on the right side and some cellulitic/edematous type changes in the soft tissues around the mandible. 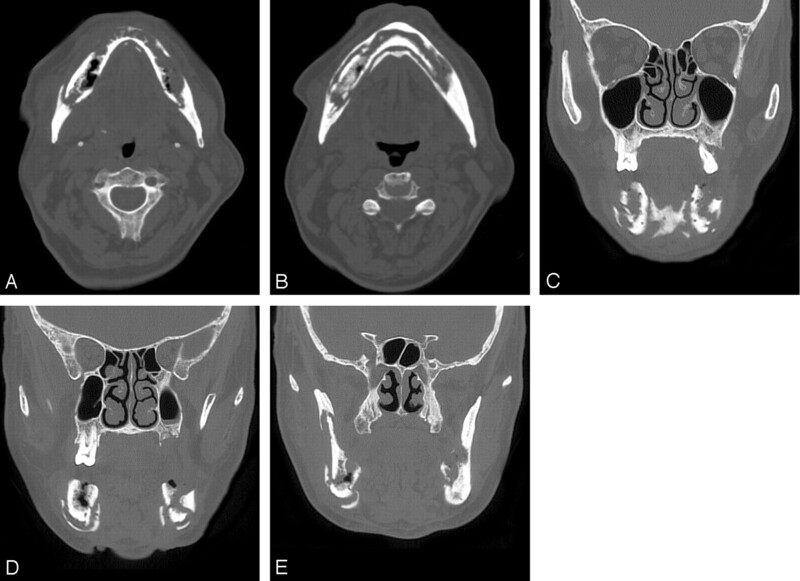 Serial axial (A and B) and coronal (C–E) CT scans of the mandible show extensive fragmentation and sequestration of this edendulous mandible. There was mild adjacent soft tissue fullness. This degree of osteonecrosis would be excessive for the more common radiation-related disease. Bisphosphonate-associated ONJ has only recently been described in the clinical literature. To the best of our knowledge, imaging features were mentioned in only 2 of these reports, and they were in patients with far more subtle disease than seen in our patient.7,8 Although the exact mechanism of bisphosphonate-associated ONJ is not fully understood, there many patients with MM, metastatic cancers, and osteoporosis who are receiving chronic bisphosphonate therapy. Because imaging studies will be conducted for many of these patients, the radiologist should be aware of this unusual entity.